Winter Triangle & Milky Way. The Winter Triangle is a prominent winter asterism formed by three stars prominent in the winter sky. 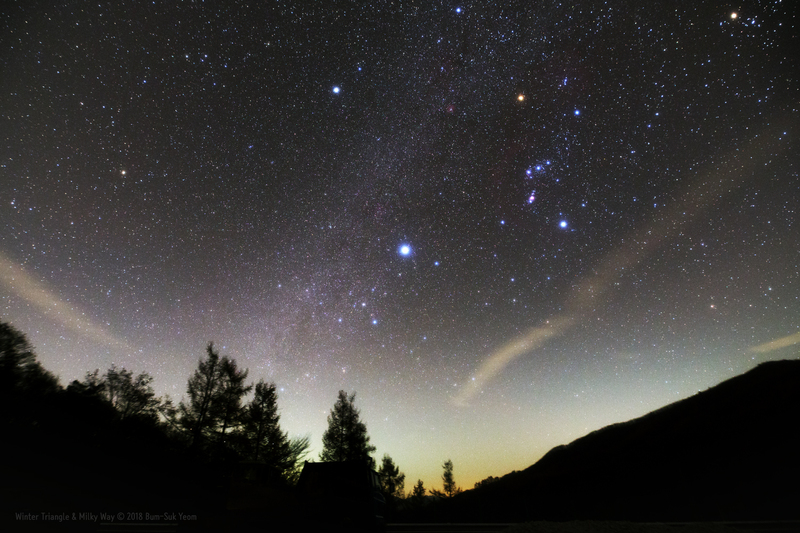 The three stars that compose the Winter Triangle are Sirius (Canis Major), Procyon (Canis Minor), and Betelgeuse (Orion). 겨울철 대삼각형을 이루는 3개의 별은 시리우스(큰개자리), 프로키온(작은개자리), 그리고 베텔게우스(오리온자리) 입니다. Taken by Bum-Suk Yeom (www.cometsky.com) on November 4, 2018 UTC @ Jangsu, South Korea. Details: 20:08 UTC (05:08 November 5 KST) Sigma Art 14-24mm F2.8 zoom lens (at 14mm) with EOS 5D Mark III camera, SkyGuider mount, Geratin filter (Lee soft #1 filter), ISO 3200, f/4, 3 x 60 sec (total 3 min) stack.